Learning to quilt the "new" way with rotary cutter, rulers and machine. Finding lots of ways to mess up. Saturday afternoon I pulled out some quilt blocks I started in a workshop back in 2008. I needed a little easy mindless stitching. I have to drag myself back to the office in the morning. AND I didn't even get to have my super fun weekend. I need more sleep. I'd better remember to set the recorder for Downton Abbey. I'll likely be asleep by the time it comes on. First things first. I have to apologize to Elaine and Leroy, and anyone else who may have gotten an unsolicited e-mail from me. I had e-mailed myself a link from work, and somehow that link did evil in my address book. I claim stupiditiy here. I really don't know how those things work. One of the young men I work with has two brothers and both his brothers became fathers to little girls born within 24 hours of each other this week. Last I heard one was needing a great deal of extra medical help. I decided to make the cousins each a little quilt. I started them at Thimbles yesterday and now I need to quilt them. I used similar dark purple plaids and the same denim blue fabric, but each little girl gets her own floral. I got up early today to do a little cooking (above is a scrambled egg with onion on a bed of lettuce with avocado on the side and salsa on top) before church. I have become a somewhat regular church-goer thanks to my oldest son's influence. I (sometimes accompanied by my husband) have been attending Fusion church in Flowery Branch, GA. Pastor Tony is amazing. He married Eron and Meredith, so that's where I met him. E & M are youth pastors, so they are very involved at Fusion. Afterward I headed over to the Lakewood Antiques Market where I spied some treasure. Above is a pre-printed emboidery panel; I'd been wanting some handwork, and this one will allow me to practice French knots, so it's perfect for me. Then I discovered the vintage piece below. I love the painted roses, the stitched embellishment and the chocolate brown x-es. Charmed me right from the start. Thanks Ginny of Ginny's Vintage and More. And from Annie's Ribbon Emporium this soft ribbon; perfect for tying up those little girls' quilts. I got the red border on. I like it better. But the pinwheels don't show up well. They didn't show up much better on the original on I made. I love the fabrics in both quilts, but should have stuck with the two-color scheme. The pattern got broken up when the values of the blues I used varied too much. I have read about color value in quilt books, but I have not thought consciously about it when putting together fabrics for my quilts. The Irish Chain quilt (below) that I was working on for a challenge (what year was that? ), and still have not finished, shows good contrast and use of value. Since I use stash fabrics in my quilts, I often don't have enough of the fabric to make all the blocks the same. In the Irish chain, most of the big yellow areas are whole pieces with the corner squares appliqued on, but one is pieced. Can you see the difference in the two pictures? Value is what's wrong with the quilt below. 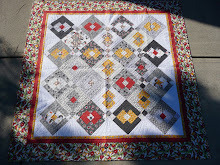 In Pepper Cory's class sample (sorry you'll have to scroll down through the linked blog post, but the photo is worth it) the background fabrics create diagonal lines through the quilt. My background fabrics were too close in value and the drama of the diagonal lines is lost. That's why I have not finished it? I wish the preprinted panels were easy to find. Let me know if you have a good website for Sashiko supplies, and I'll promote it here on the blog. Last, for this post, is a little bitty quilt top I made from some scraps I found in Mom's (Linda Brannock's) discards. No lesson about value here; I was just making something useful from scraps, but you can see value at work in it too. He: I want you to be careful when you travel to south Atlanta. He: I don't want to have to identify your body in a morgue. She: Because you wouldn't be able to. He: You have a birthmark between your toes. She (baring toes): Show me. He (examining toes): I know it's here somewhere. She: Confused for the ex-wife again. Started and Completed in the same year.